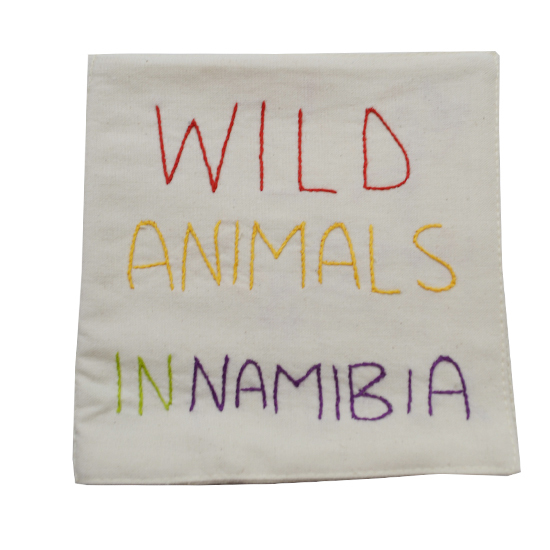 Cotton book with vibrant colored, embroidered pictures of the wild animals of Namibia - for little mind travelers to Africa. Beautifully embroidered and hand-made by Penduka artists. Cotton book with vibrant colored, embroidered pictures of the wild animals of Namibia - for little mind travelers to Africa. Usual motifs include the warthog, a rhino, a giraffe, an oryx gazelle, a porcupine, and bustard bird. Beautifully embroidered and hand-made by Penduka artists from the slums of Katutura district, Windhoek. Each book contains a label with the artist's name who embroidered the book. Available in off-white with varying bright colored embroidery. 100% cotton, machine washable. Size 13cm x 13cm, colours may vary.